Symphony Parnassus serves up a rare opportunity at our Jan. 28 concert: The chance to hear two young sisters perform separate concertos with the orchestra. Sarah Smith, president of the Symphony Parnassus Board of Directors, said, that to her knowledge, this is the first time in the history of the orchestra that two siblings will have shared the spotlight as soloists in the same concert. The sisters are winners of the 2017 Symphony Parnassus / San Francisco Conservatory of Music Competition, an annual event that showcases some of the brightest upcoming talent in classical music, and have won numerous other prizes. Starla Breshears, 10, will perform Haydn’s Cello Concerto No. 1 in C Major; and Valery Breshears, 8, will perform Mozart’s Violin Concerto No. 3 in G Major. Starla, who studies with renowned cellist Christine Walevska, says that her performance with Parnassus will be her second time playing the entire Haydn concerto with an orchestra; she has performed separate movements with other orchestras (including one at the Bear Valley Music Festival, and with the Holy Names University Orchestra). She says she was drawn to the “deep tone” of the cello when she started playing at age 3. Valery is excited to perform the entire Mozart concerto with an orchestra for the first time. She has performed the first movement with two other orchestras (Fremont Symphony and Paradise Symphony Orchestra), but not the entire piece. 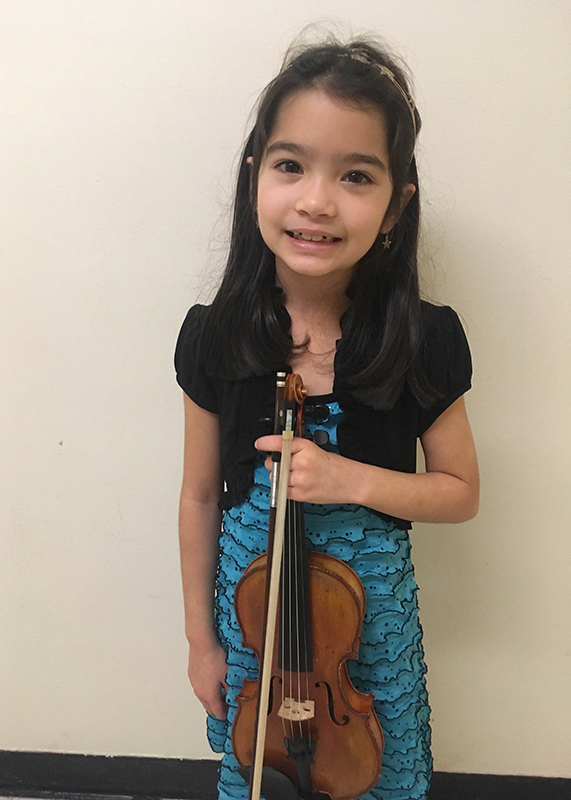 She has been playing violin since age 2 and currently studies with William Barbini at the San Francisco Conservatory of Music. The sisters also perform with older brother Dustin Jr., 11, a violinist, as the Little Stars Trio, which has toured internationally to festivals and events in Mexico, Argentina and England. This past year in Los Angeles, they performed on “Little Big Shots,” (NBC, Sundays, 8 p.m.) a TV variety show hosted by Steve Harvey that showcases youth performers ranging from musical virtuosos to martial arts experts. The show taped in October and will air in Season 3 sometime this March. They also traveled in November to London to tape an appearance in the British version of the program that will air in the spring in Great Britain. Both versions of the show boast audiences of 8 million viewers in their respective countries. The Little Stars Trio can often be found performing “Eine Kleine Nachtmusik,” “Simple Gifts,” and other favorites (some pieces they arrange themselves, with the help of their parents) for tourists near Powell and Market streets in downtown San Francisco on most Saturdays after lessons and rehearsals at the S.F. Conservatory of Music, where all three participate in the Pre-College Program for up-and-coming classical musicians. The Breshears sisters live with their parents Dustin and Julie—both pianists and teachers—and four other siblings in Chico, California. Two of the three youngest, Colin, 5, and Delilah, almost 3, are already taking lessons on the violin and cello, respectively. Serenity, at 1-year-old is the youngest Breshears, will take up the violin, according to Dustin Sr.
It’s safe to say we can expect to hear more and more music from the talented Breshears family.